Notice: The next event in this series of Workshops will be in Rome, Italy, in November 2017. This series of Workshops, started in 2005, aims at providing a forum for material scientists, chemists and physicists where to debate about the state of the art and the perspectives of the photonic materials based on rare earth ions. Both fundamental photolumi-nescence properties and application oriented material investigations are considered. The first edition of the Workshop was held in Trento in May 2005 and was attended by more than 60 experts from 8 Countries (see the photo gallery). Several papers presented during the 1st PRE Workshop were published in a special issue of OPTICAL MATERIALS (Volume 28, issue 11, August 2006). The Guest Editors of that issue were Giancarlo C. Righini, Maurizio Ferrari and Bernard Champagnon. The second edition of the Workshop was also held in Trento, on May 31st - June 1st, 2007, with some 80 participants. Again, several papers presented during the 2nd PRE Workshop were published in a special issue of OPTICAL MATERIALS (Volume 31, issue 9, July 2009). The Guest Editors of that issue were Giancarlo C. Righini, Maurizio Ferrari and Setsuhira Tanabe. 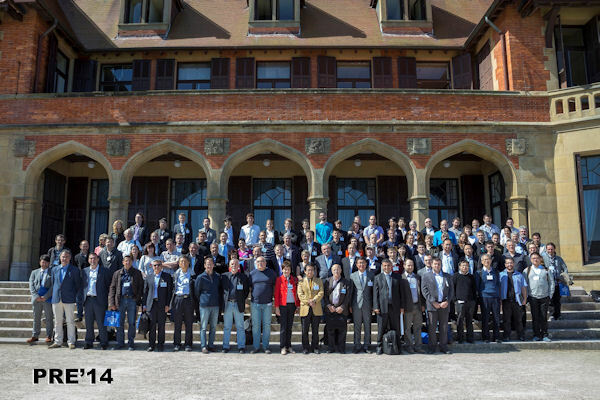 The third edition (PRE'10) was held in Florence, followed by a record-breaking edition (PRE'12: a photo gallery is available at www.pre12.org) in Kyoto, Japan, and by PRE'14 in San Sebastian - Donostia, Spain ) (a photo gallery of PRE'14 is also available). Finally, the most recent event in the series was PRE'16, held in Greenville, SC (USA), from 8 to 10 June, 2016.